After a full day building camp, several friends formed a group to go out. Of course I wanted to join! I grabbed my necessities (headlamp, toilet paper, goggles, emergency champagne) and hopped on my bike. As we turned onto the esplanade, art installations rose from the dust as far as I could see. I lagged to catch glimpses of them as we passed. Art or friends? Art or friends? Curiosity pulled at me. And then — we approached a pier. Group mission be damned! This was the emptiest the playa would be for the rest of the week, and soon the pier would be crammed with tourists. I stopped and put my feet onto the dust. I pulled the scarf off my mouth and called to my friends: “Guys! I’m stopping to look at art!” Either they didn’t hear me or didn’t care. Except for Kitten, my faithful companion. “I can’t keep passing art installations. It’s our first night out,” I looked towards our group; they had already blended in with the other blinking lights. “We have all week to find music, but we only have a week to look at art,” Kitten dismounted his bike. We stepped onto the pier. Nets and ropes hung between posts, hammocks swayed beneath the boardwalk. A long string of lights romanced me. I hooked my arm into Kitten’s. The boards creaked under our footsteps — just like the old boardwalks I’ve wandered along in seaside towns. And for a moment, when I relaxed my eyes and looked up, it felt like we were at the sea. But looking down, seeing the dry lake bed below us, I thought of the sheer genius and manpower it must have taken to build this dock — from the concept to the design to bringing the materials and assembling them in the middle of nowhere without basic amenities like running water. We arrived at the midway tower. We leaned in to view its inner intricacies. Some people were gathered on the upper level; I’d be willing to bet they were drinking whiskey. “Want to go up?” Kitten asked. “Not particularly.” I felt content looking inside the tower at the details that made it seem more like a relic than a modern piece of art. It gave me a sense of nostalgia for a time I knew only in turn-of-the-century novels. Antique photographs, compasses, hourglasses, bound books, and glass bottles — in all colors, sizes and shapes — the scene piqued my curiosity to touch and pick up the items. Every detail existed for exploration, a mystery to be revealed, a reverie in which to lose oneself. It was a living, breathing piece of art that transported us to a different time and place. The curiosity, the wonder of it all, put me back into the frame of mind of a child: everything was new and strange and deeply interesting. On the other side of the tower, we found an antique desk — the kind in which the door to the main compartment folds down to become the writing surface. My literary heart skipped a beat. “And what could be inside?” My curiosity whispered with glee. When I opened it, I found the cubbies, that once may have organized papers and mail, were filled with antique glass bottles. How odd. I touched a few, pulling them out of the compartments and examining their details, trying to understand their riddle. And then — I found one that contained a piece of paper. I slowly put my index finger into the bottle, careful not to touch the toothlike edge, but my fingertip barely reached the paper. I pushed in a little more until the base of my finger rested against the pointed teeth. I could only move the paper around in circles along the side of the bottle. The shape of the neck made it impossible to drag the paper out. I sighed and pulled my finger out. “I’m just too curious.” I turned the bottle over and around, trying to see if I could read the message from the outside, but the paper was folded in half. Even more mysterious. I inverted the bottle and shook it, but the paper wouldn’t fall out. I held the bottle so the paper was at the very base of the neck. I put my finger back in and pressed the paper firmly against the glass. It slid along the edge, I almost got it passed the base of the neck, but it slipped back. “Leave it, come on, there’s a lot more to look at,” Kitten said. “There’s bottles everywhere. Just look at all these bottles over here.” He motioned to a couple of antique suitcases behind us with bottles on top of them. I turned the bottle a little more, got my hand on the side with the shortest teeth and finally — I had the paper sliding up the neck and out of the bottle! I held it in my hand like it was a golden scroll of truth. “Yes!” I said to Kitten, my eyes wild with excitement. I unfurled the paper and paused. I was hungry for the message I worked so hard to receive, but needed a deep breath. Delayed gratification. “Come on, open it,” Kitten said. Kitten and I looked at each other and burst into laughter. “Oh that is good,” I said as I caught my breath. “We should’ve seen that coming,” Kitten smiled. “It couldn’t have been more perfect,” Kitten agreed. I put the bottle back exactly where I found it and closed the desk. Kitten and I continued our walk along the creaking pier to the very end. 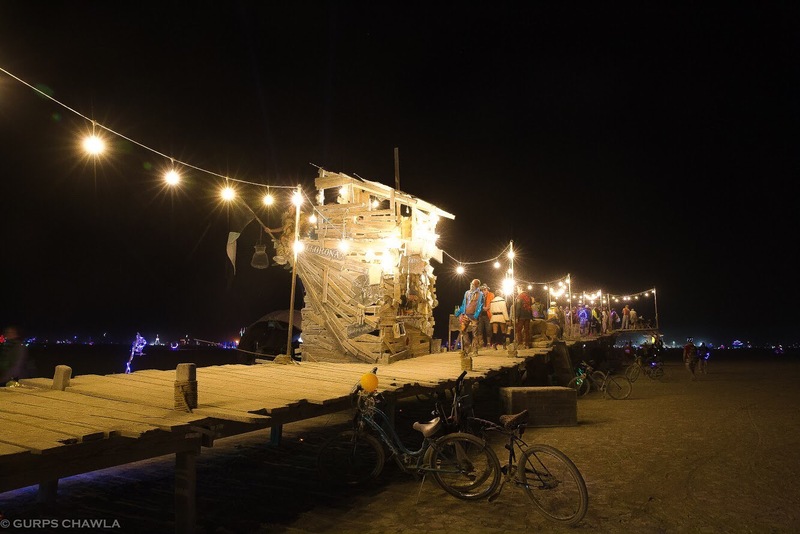 I looked out at the playa — illuminated art installations dotted the landscape — and I realized this pier was on an endless sea of wonder.